Several factors contributed to the College regaining its R1 status, according to vice provost for research and biochemistry professor at the Geisel School of Medicine Dean Madden. Madden said that there has been more financial support for faculty initiatives and hiring. “All of that collectively feeds into the numbers that influence the Carnegie ranking,” he explained. Another factor Madden credited was a science strategy review — a faculty-compiled report that examined the practices of the College’s science departments — that was delivered in December 2016. Madden said he believes that regaining the R1 classification is a positive step for the future of the College. He added that the recognition of the College’s research helps promote Dartmouth to prospective students and faculty. This information helped to clarify that some of the differences between the College and its peer institutions were not a question of investment in research, but rather a lack of reporting of the research being conducted. “Another piece of it is that [between 2015 and 2018] the faculty had been increasingly successful at developing new research directions and getting extramural research support,” Madden said, and that Dartmouth has been investing funds in faculty potential for extramural support for their scholarly activities. Victor Borden, current project director for the Carnegie Classification of Institutions of Higher Education, explained that he and his team at the Center for Post-Secondary Research at Indiana University create a research activity index that comprises a number of different indicators of research activity. Four of the indicators pertain to research doctoral degrees and the remaining three focus on staffing and expenditures. He noted that the classifications are simple assortments based on a complex measure of research activity. “We try to make it a comprehensive index ... so that institutions with a more comprehensive array of programs will get activity registered through those different [kinds of activity],” he said. He said that the classification is not intended to reflect research quality or impact, and that there is no intent for the qualification to have a positive or negative implication for the institution. He added that it is simply a quantitative level of research measure. Borden remarked that the Carnegie Classifications’ role as a marker of prestige is an unintended consequence of the project. 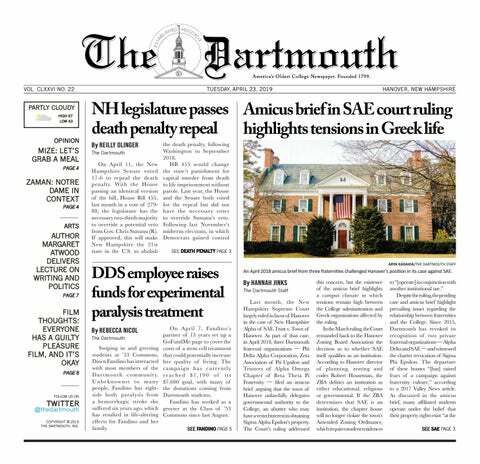 “We do include an aggregate measure and a per capita measure per faculty, so we can enable smaller, but intensive research universities ... Dartmouth would fall into that category,” he said. When the College was demoted to an R2 classification during the 2015 assessment, Borden said it coincided with a change in the Carnegie Classification methodology that gave less weight to the per capita index — a calculation that was previously used in an effort to level the playing field for smaller research institutions like the College. Borden explained that for colleges and universities that do not definitively fall in either the R1 or R2 category, the consistent shifts in the methodology may change their placement. He also acknowledged that the methodological shifts and complexities of the classification could have been a reason for the 2015 demotion.